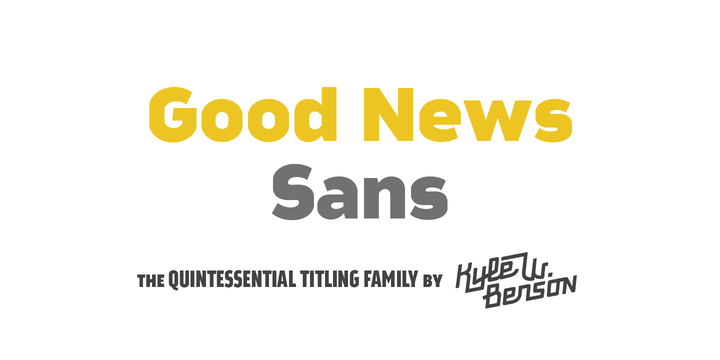 Good News Sans is a sans-serif font created by Kyle Benson and published by Kyle Wayne Benson. It has been especially designed to help writers expose their ideas in a clear manner and invest words with an aura of credibility. Good news Sans gives the message simplicity which facilitates the process of reaching the target audience. It provides all the elements you need to impress your readers, including wide language support, Open Type functions, many stylistic alternates and ordinal catchwords. A font description published on Monday, July 21st, 2014 in Fonts, Kyle Wayne Benson by Iulia that has 4,356 views.